Looks like Chip has great "uncle" potential! I really enjoy seeing photos of your herd. I am enjoying your photos of the growing herd as well Farmgirl. Love your site. Someday I want sheep, dangit! Ahh! Evey morning, I start the day with my cup of coffee and the Daily Farm Photo. Thank you so much! You know I can't get enough pictures of the sheepies. Keep 'em comin'! I couldn't take the break from the cuteness... I don't blame Chip for wanting to kiss the little one, I do too! The lamb pictures are killing me. So cute. I just want to cuddle them. Precious- that is what they both are. 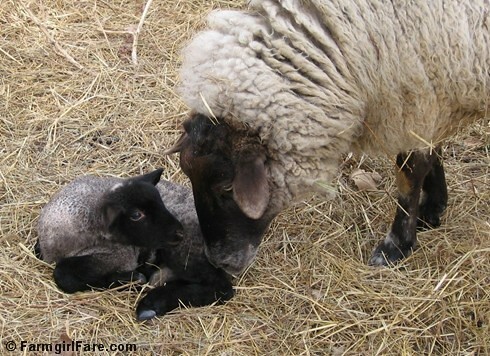 Question: Are sheep really hard to raise? I have raised hogs, chickens, goats, and cows. When I retire, I would like to have a few sheep, but know abolutely nothing about them. What a great photo. Inquisitive skinny Chip! And you're right about the attention grabber. What a cutie. What a great shot--so sweet! Thanks for your comments on the mad food blogger post at Tea and Cookies. Just a little while ago I saw something so incredibly cute. There is one hut in the barnyard that the sheep sort of fight over. When Doll Face was "released" from her bonding pen in the barn with her baby, she immediately claimed the hut. I have a photo of her sprawled out in the middle, front legs out in front of her (not the way sheep normally sit) obviously trying to take up as much room as possible. Her baby was curled up in a corner. Anyway, all the lambs love to hang out in the hut. Well, when I went down to check on them just a little while ago (in the dark, without a camera) I busted humongous Sweet Pea taking up most of the left side, with two little lambs curled up into the rear right corner and one little lamb pacing back and forth in front of the hut, I guess afraid to try to get past Sweet Pea. The whole thing was priceless. Someday you will get sheep, dangit! (Hint: start hanging out at the auction barn. You won't be able to resist bidding. . . : ) And when are you going to get a donkey???? Well didn't you just make my day. You are very welcome! Just when I'm afraid I'm putting up one too many sheep photos (or cat photos or Donkey Doodle Dandy photos), I get positive reinforcement. It's great. You are on the right track! I once asked a friend who had raised hogs, chickens, cows, turkeys, and probably something else why she didn't want sheep. "Not enough of a challenge," she said. LOL, that's my kind of farm animal! If you've survived all those other beasties and haven't fled to an apartment in the city, I bet you would just love having a little retirement flock to keep you busy. It's really fun watching the reactions of the older sheep to the baby lambs. The other day I caught one yearling lamb leaping and jumping and running around with the babies. It was a riot. She was having a great time.